Scoliosis Metabolic Profile Testing. Is a Low Phosphate Diet Protective? Home / Are Low Levels of Phosphorus Protective Against Scoliosis Progression? Calcium and Phosphorus are both important for normal bone mineralization, and can be mobilized to and from the blood stream and into the bone depending upon body homeostasis. Hormones (Parathyroid hormone and Estrogen) are mostly responsible for signaling when the minerals should be stored or released. In Adolescent Scoliosis, bone mineralization has been identified as a risk factor for progression and can be present even in young patients. So it would seem logical that those with scoliosis would suffer from low calcium or other minerals responsible for developing strong bones. However, availability of bone minerals is not the only factor to consider when you find out your bone density is low for your age. Studies confirm girls with Idiopathic Scoliosis have lower levels of Estrogen, higher testosterone, and low low low Vitamin D. (One last thought here, Vitamin D was shown to be lowest in the Winter and Autumn Months). Osteopontin (OPN) is a highly acidic protein that is excreted from most body tissues, and is unregulated in tissues during mechanical injury or insult. OPN is a pro-inflammatory cytokine that has been shown to be involved in the promotion of disease states, whether it be periodontal disease, arteriosclerosis, Kidney disease, Osteoporosis or Scoliosis. Some studies show blocking Osteopontin is effective in stoping progressive disease, making it a target for therapies. OPN has an affinity for Osteoclasts and in elevated levels are directly responsible for bone demineralization, and can be responsible for ectopic calcifications like those seen in kidney stones and arteriosclerosis. Studies show as scoliosis of the spine initiates, the level of osteopontin in the tissues increases. Furthermore, as the curvatures become more severe, so does the amount of circulating Osteopontin in the blood. Researchers tested the make up of hip bones and compared individuals with Scoliosis to a control group. 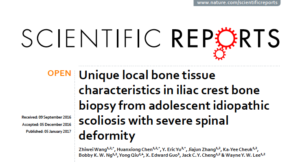 As you might expect after reading the first part of this post, the calcium and phosphorus levels were comparable and likely not a etiopathological factor in scoliosis initiation. However, they did find that the scoliosis patients bones had more Osteiod in their bone matrix. Osteiod is the unmineralized protein that is secreted by the Osteoblast cells. 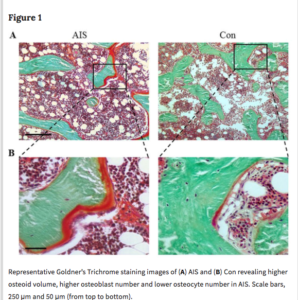 When Osteoid accumulates and is left unmineralized, it can lead to conditions such as Osteomalicia, literally meaning “soft bones.” The authors attribute the increased Osteoid to an increase in the number of Osteoblast cells and abnormal Osteocytes. What are the benefit of a Low Phosphate Diet? This entry was posted in Blog, Scoliosis on July 7, 2017 by Marc Lamantia D.C..